This Boss Industrial GD16T21 16-Ton dual action (2-way) wood splitter offers you 16-Ton of splitting force with a 8 second total split time (4-seconds each way). Full tow package is included. Equipped with a 6.5 HP Kohler Courage 4-Cycle Engine. Find out why BOSS wood splitters have become a known name in the firewood industry with this 16-Ton gas log splitter. 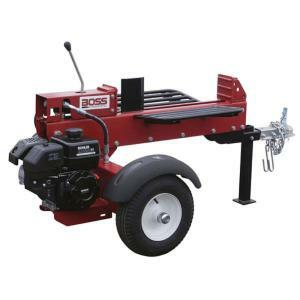 Tbook.com crawls the web to find the best prices and availability on Industrial Hardware and related Tools and Hardware products like Boss Industrial 16-Ton 196cc Gas Log Splitter. For this page, related items include products we find that match the following keywords: "Industrial" at our vendor partner Home Depot. Boss Industrial 16-Ton 196cc Gas Log Splitter is one of 143 Industrial Hardware and related products listed in the Tools and Hardware section of Tbook.com If you have any questions on this product, please give us a call at 734-971-1210 during the hours of 9am - 5pm EST for assistance. Thank you for shopping at Tbook.com, the Internet Department Store!